For other uses, see Mack (disambiguation). Mack Trucks, Inc., is an American truck–manufacturing company and a former manufacturer of buses and trolley buses. Founded in 1900 as the Mack Brothers Company, it manufactured its first truck in 1907 and adopted its present name in 1922. Mack Trucks is a subsidiary of AB Volvo which purchased Mack along with Renault Trucks in 2000. After being founded in Brooklyn, New York, the company's headquarters were in Allentown, Pennsylvania from 1905 to 2009 when they moved to Greensboro, North Carolina. The entire line of Mack products is still produced in Lower Macungie, Pennsylvania, with additional assembly plants in Pennsylvania, Maryland, Australia, and Venezuela. There was also (previously) a Mack plant in Hayward, California. Parts for Mack's right-hand-drive vehicles are produced in Brisbane, Australia for worldwide distribution. Assembly for South America is done at Mack de Venezuela C.A., in Caracas, Venezuela. The Venezuela operation is a complete knock down (CKD) facility. Components are shipped from the United States to Caracas for final assembly. In addition to its Macungie manufacturing facility, Mack also has a remanufacturing center in Middletown, Pennsylvania. Relocation of Mack's head office, product development, most support functions, and purchasing functions to Greensboro, North Carolina, in 2009. Mack's parent, Volvo Trucks, already has its North American base in Greensboro. This is a timeline of Mack Trucks history. Most of the information is taken from the Mack history page at MackTrucks.com, unless otherwise noted. Mack truck used to carry ore at the Acosta Mine Museum in Real del Monte, Hidalgo State, Mexico. The Hale 100-inch mirror for Mount Wilson Observatory on its way up the Mount Wilson Toll Road on a Mack truck in 1917. This 1939 Mack truck that has been restored and is on display at the YRC Freight headquarters in Overland Park, Kansas. A Mack C-49-DT bus built in 1956. 1890: John M. ("Jack") Mack gets a job at Fallesen & Berry, a carriage and wagon company in Brooklyn, New York. 1893: John Mack and his brother Augustus F. ("Gus") Mack buy Fallesen & Berry. 1894: A third Mack brother, William C. Mack joins his brothers in the company's operations. The Macks explore working with steam powered and electric motor cars. 1900: The Macks open their first bus manufacturing plant. Ordered by a sightseeing company, the first "Mack bus" is delivered. 1902: The Mack Brothers Company is established in New York. 1904: Mack Brothers introduces the brand name "Manhattan" on its products. 1905: Allentown is selected as the home of main manufacturing operations, and headquarters. A fourth Mack brother, Joseph Mack becomes a stockholder. Mack also begins making rail cars and locomotives. 1910: The "Manhattan" brand trucks are redesignated "Mack" trucks. A fifth Mack brother Charles Mack joins the company. 1911: Headed by C.P. Coleman, The Saurer Motor Truck Company acquires rights to manufacture and sell heavy trucks under the Saurer brand name at its plant in Plainfield, New Jersey. On September 23, 1911, the Saurer Motor Truck Company merges with the Mack Brothers Motor Car Company of Allentown headed by J. M. Mack, forming the International Motor Truck Company (IMTC). IMTC continues to make and sell trucks using the Saurer name until 1918. In 1911, IMTC is capitalized at $2.6 million total ($1.6m or 61.5% for Saurer and $1.0m for Mack Brothers). 1912: Brothers John and Joseph Mack leave the company. 1919: The United States Army conducts a transcontinental project using Mack Trucks to study the need for and feasibility of a new interstate highway system. 1922: The company name is changed to Mack Trucks, Inc. The bulldog is established as the company's corporate symbol. 1924: John Mack dies in a car crash in Weatherly, Pennsylvania. 1932: While recuperating from an operation, Mack's chief engineer Alfred Fellows Masury carves Mack's first bulldog hood ornament. 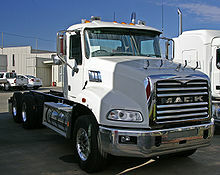 Masury applies for and receives a U.S. patent for his design; the bulldog hood ornament adorns Mack trucks ever since. 1933: Mack Trucks (as the company is more widely becoming known) are used in building of many ambitious construction projects for the Work Projects Administration including the Hoover Dam. 1941: Fire Apparatus manufacturing is moved from Allentown, Pennsylvania, to Long Island City, in Queens, New York. 1956: Mack Trucks, Inc. buys Brockway Motor Company. (Brockway later ceases operations in 1977). 1966: Mack begins production at its new assembly plant in Oakville, Ontario, Canada. The facility is later closed in 1993. 1967: Mack Trucks becomes a part of the Signal Oil and Gas Company in a one-for-one exchange for cumulative convertible preferred stock. Later that year Signal changes its name to Signal Companies. 1970: Mack moves into its new Allentown world headquarters. 1982: Renault increases its shareholding to 20%, Signal reduces its stake to 10%. 1983: Mack Trucks conducts an IPO, issuing 15.7 million shares of common stock. Renault increases its holdings to 40% and Signal reduces its stake to 10.3% ownership. 1987: Renault reorganizes; Renault's Mack shares are transferred to Renault Véhicules Industriels. 1990: Mack Trucks becomes a wholly owned subsidiary of Renault Véhicules Industriels when the remaining publicly traded shares are acquired at $6.25 per share. 2001: Mack together with Renault Véhicules Industriels becomes part of Volvo, and the parent company Renault receives a 20% stake in the combined company. (In 2002 Renault Véhicules Industriels changes its name to Renault Trucks). 2006: Mack has a record-sales year. 2008: Mack announces relocation of corporate headquarters to Greensboro, North Carolina. This is a timeline of Mack Trucks history. Most of the information is taken from the Mack History page at MackTrucks.com, unless otherwise noted. Photos of most models 1906–1978 available at. 1909: A junior model 1-1/2 ton truck is introduced. 1910: Mack delivers the first motorized hook and ladder firetruck used by the city of Morristown, New Jersey. 1916: The Mack ACs are introduced. Ultimately, over 40,000 of these models are sold. World War I: Mack delivers over 6,000 trucks, both to the United States and Britain's military. A legend surfaces that British soldiers would call for Mack Bulldogs to be sent when facing adversity. 1918: Mack becomes the first manufacturer to apply air cleaners and oil filters to their trucks. 1920: Mack Trucks are the first with power brakes on their trucks. 1922: International Motors Company develops gasoline-driven passenger railcar for the New York, New Haven and Hartford Railroad. A standard passenger railcar on top of a standard motor truck chassis, seating between 36 and 50 passengers, at a cost of $16,500. The car operates in a ten-mile (16 km) stretch between New Haven, and Derby, Connecticut. 1927: Mack's BJ and BB models built. 1932: The Bulldog starts to travel on the hoods of Mack trucks. 1934: Production of electric "trolley coaches" began, continuing only until 1943. A total of 290 trolley buses were built, with Portland, Oregon being by far the biggest customer (with 141 total). 1936: The Mack E series introduced. Mack Jr trucks introduced. 1938: Mack trucks is the first company to produce its own heavy-duty diesel engines. World War II: Mack trucks were used by the military in various capacities, and the company built many heavy-duty trucks to help the allied forces win the day. From 1941 to 1945, the combined armed forces of the United States, Great Britain, France, and Canada took delivery of 35,096 total vehicles. The combat "N Series" (NB, NJU, NM, NO, NR, etc.) accounted for 26,965 of the total. Commercial type vehicles including: trucks, off-highway, fire-trucks, trailers, and buses, accounted for the rest. A total of 2,053 NO models alone were produced from 1940 to 1945. The 7 1/2-ton 6x6 NO was the most important specifically military model, and could be used as a transport or tractor for the 155 mm Long Tom field gun. Mack also built over 2600 power trains for tanks. The Allentown bus plant (5C) built Vultee PBY Catalina flying boats as well as components for the BT-13 Valiant Trainer and B-24 Liberator Bombers. More than 700 NJU (5-to-6 ton 4x4) models were in the hands of the U.S. Army by 1942. In 1939 & 1940 the French and British received several hundred NR4 and EXBU models. Mack Trucks ranked 63rd among United States corporations in the value of World War II military production contracts. 1940: L Model series introduced, continuing until 1952. 1950: The Mack A Model series of trucks is introduced, produced until 1953. 1953: The Mack B Model series of trucks is introduced. 127,786 produced until 1966. 1955: The D Model low cab forward city delivery truck entered the market. Access to the engine compartment was possible by the Verti-lift cab. The cab lifted straight up hydraulically, guided by a forklift style mast behind the cab. Two styles of D Models were produced, the first styling had a square grille and no dress up trim. It was produced in 1955 and early 1956. The second styling included a styled grille, cab rear corner windows and stylish emblems and trim. The second styling was built from mid 1956 until the end of the D Model in 1958. 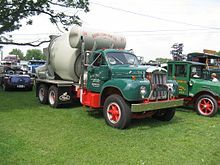 A total of 832 D Model Mack Trucks were produced from 1955 until 1958. 1955: The military M123 10 ton 6X6 semi tractor went into production. Developed from the NO, it would be the US Army's standard until replaced by the M911 starting in 1976. 1956: Mack buys the tooling of the Ahrens-Fox Fire Engine Co. and introduced the Mack C Model cab forward fire engine which was an Ahrens-Fox design and the first of the "Cincinnati Cabs" ( later built by the Truck Cab Manufacturing Co. an OEM vendor builder of Cincinnati, Ohio), that have been the staple of the American fire service to this day. 1960: City of Hamilton, Bermuda buys first Mack built diesel-power fire truck in a B Model Chassis. 1962: The Second of the COE (cab-over-engine) family of trucks is introduced: The F Model all steel sleeper (FL) or non sleeper (F) is the first of this family of models for Mack. 1965: Mack releases the Super Pumper System, to be used by the New York City fire department. It would help put out 2,200 fires. 1965: The R Model Series introduced, to replace the B Model Series. Some R series models continue in production until 2005. 1966: The RL (for R-Western) model built at Hayward, California until 1981. 1967: The CF model Fire Engine introduced, replacing the C model. The CF was a cab forward adaptation of the cab over style commercial "F" Model cab. 1969: Mack patents the cab air suspension. 1975: Macungie plant opens, build the Cruise-Liner series until 1983. 1977: Super-Liner introduced, production runs for 15-years until 1993. 1978: Introduction of the low-cab-forward urban MC/MR series. 1979: Medium-duty model Mid-Liner introduced, built by Renault Véhicules Industriels in France. This lighter truck filled a gap at the lower end of Mack's spectrum, as they were almost unrepresented in the Class 6 segment. Before the introduction of the Mid-Liner, the smallest engine made by Mack had been the 210 hp diesel inline-six ETZ 477. 1982: Production of the MH Ultra-Liner model begins. 1988: Mack introduces the CH series for highway applications. 1990: Fire Apparatus production ends. 1994: Mack introduces the LE (low entry) refuse vehicle. 1999: A new premium highway tractor is introduced: the "Vision by Mack". 2001: Medium-duty Freedom series introduced (built by Renault Trucks in France like its predecessor, the Mid-Liner series). 2001: Mack redesigns R Series dash with new gauges and buttons and door padding. 2001: Granite series for construction applications introduced. 2003: Mack pulls out of the medium-duty market and discontinues the Freedom series. 2006: Introduction of Pinnacle highway vehicle it is which was the replacement for the Vision highway product. 2007: A new product line is introduced to include Models LEU and MRU amongst others. 2007: Introduction of US07 compliant engines in all of its trucks. 2008: In March, Mack introduces the Titan, a heavy duty model with a 16-liter big-block MP10, the largest ever 6-cylinder engine from Mack, with 515, 565, and 605 horsepower (451 kW) models. 2010: In October Mack announced that a version of its Terrapro Cabover would run on natural gas using a Cummins Westport engine. 2017 Mack discontinues Titan with last on rolling off line mid summer. 2017 Mack introduces Anthem. New on-highway tractor replacing the Pinnacle Axle back model. List of current models produced for the North American market. List of current models produced for the Australian, New Zealand, and South African market at the Wacol, Queensland factory. Mack Trucks produced fire apparatuses from 1911 until 1990. Despite the abrupt shutdown of their production, many have been refurbished and still serve with fire departments throughout the world. Mack started to produce the Mack R series (R, RW, and U models) in 1966 for highway use, and the RD, DM, and all wheel drive RM and DMM models for construction use. The lightweight RL model followed in 1967, the RW Superliner with a large, rectangular hood and grill in 1977, and the setback front axle RB in the 1990s. All these models featured the same cab; the U, DM, and DMM had the cab offset to the left. In the 1990s, the R, RW, and U series models were discontinued and the RB was introduced, mostly for severe-duty applications. The hood was modified slightly for the model RB. 2004 was the last year for the RD, and 2006 for the RB and DM. The DM was the last model to use this cab style, and was the last model of this family to be produced. As a replacement for the construction models, Mack started to offer the Granite, Granite Bridge-Formula and Granite Axle-back. By 1916 Mack was producing 4- and 6-cylinder gasoline engines, and through 2014 continued to offer their own, in the form of three diesel I6s. Engines by other manufacturers were often optional, supplied over the years by Caterpillar, Cummins, Chrysler, Detroit Diesel, Hercules, Scania, and Waukesha. Mack started making diesels in 1938, in 1957 the END and turbocharged ENDT 673 diesel were introduced. This 672 cu in (11.0 L) I6 engine family was successful, and remained in production for over 30 years. In the early 1960s, Walter May, executive vice president of product and engineering at Mack Trucks HQ in Allentown, PA., prioritized research and development of a high-torque rise engine. Winton Pelizzoni, chief engineer at the Mack Trucks powertrain facility in Hagerstown, MD., designed an innovative engine based on this concept and then led development of the prototype that went into production. The engine was introduced as an inline six in 1966, as a V8 in 1970, and as the intercooled inline six 300 series in 1973. This was an industry-changing event. The Maxidyne, with an operating range of 1200–2100 R.P.M, and later 1050–1700 R.P.M., allowed a heavy Class 8 truck to be operated with a 5 speed (Maxitorque) transmission. Previously, heavy trucks typically operated between 1800-2100R.P.M. and were equipped with 10 or more gears. Mack also produced railroad cars and locomotives between 1905 and 1930. The company's trademark is the bulldog, which can be found on the front of almost all Mack trucks. A gold-plated bulldog indicates the truck was made with a Mack produced drive train, engine, transmission and drive axles. A chrome bulldog indicates other manufacturers' components were used. Mack trucks earned their nickname during World War I, when the British government purchased the Mack AC for supplying its front lines. Its pugnacious, blunt-nosed hood, tenacious performance, and durability, reminded the soldiers of their country's mascot, the British Bulldog. The logo was first used in 1921 for the AB chain drive models and became the official corporate logo in 1922. Mack built over 35,000 heavy duty military trucks during World War II, most for export under Lend-Lease. None were US Army standard types, all were designed and built exclusively by Mack. Since World War II, Mack has had limited military production. The M39 (G-744) series, which includes the M54 cargo truck, were a standardized military design 5 ton (4,536 kg) 6x6 chassis, with many models. Mack developed a competing design, when the M39 was standardized Mack built a relatively small number of M51 dump trucks. In the early 1960s they took part in a short lived program to retrofit some of the series with Mack END 672 engines. The M123 and M125 (G-792) were standardized military design 10 ton (9,072 kg) 6x6 semi tractors and artillery prime movers. Designed by Mack, using many components from the NO series. Mack built 392 M123s, used with a lowboy trailer to recover and transport tanks, and all 552 M125s, between 1955 and 1957. Later follow-up orders called for 420 M123s and retrofitted 210 more with Cummins engines. The 1968 C&W song "Phantom 309" by Red Sovine is about a ghost trucker who, when asked about the name Phantom 309, replies that "This Ole' Mack will put 'em all to shame. There aint a driver or rig runnin' any line that seen nothin' but taillights from 'Phantom 309'". Five 1970s Mack RS700 series & one Cruise Liner COE trucks were used in the motion picture Convoy starring Kris Kristofferson as Martin 'Rubber Duck' Penwald and Ali MacGraw as Melissa. A 1970s Mack R-600 truck with a "coolpower" engine setup is used to haul an oil tanker in Mad Max 2: The Road Warrior. Mack DM series dump trucks appeared prominently in Die Hard with a Vengeance (the third movie in the series). Maximum Overdrive (1986) is a horror tale of machinery come to life which includes a truck stop with various vehicles. A Mack M915 (LHRT) Line-Haul Replacement Tractor (military version of the Mack Granite GU713 10-wheeler) with a (military version M970 fuel tanker) semi-trailer, was the vehicle mode for Megatron in Transformers: Dark of the Moon. The beginning of Blake Crouch's best selling novel Pines has the main protagonist. Secret Service Agent Ethan Burke. suffering temporary amnesia after the car he is travelling in crashes. He believes he must seek out a person named "Mack" as it the only word he is able to recall. He later realizes the significant of "Mack" is in fact his recollection of his vehicle being intentionally hit by a Mack truck. A 1984 Mack Superliner, owned by J.R. Collins Pulling Team, is also officially sponsored by Mack. The truck (named "Buckeye Bulldog") runs in the NTPA (National Tractor Pulling Association) in the "Super Semi" class. Dale Gribble, a character from King of the Hill, is rarely seen without his Mack cap. In Bad Boys II (2003), a 2000 Mack CX 613 Vision truck is used by the villains. In the film Cars, Mack is Lightning McQueen's transport, an animated 1985 Mack Super-Liner voiced by John Ratzenberger. Ratzenberger's father drove a Mack truck to deliver oil for three decades. On the "Disney/Pixar Road Trip '06", which promoted the film in a four-month tour of forty-one cities, "Mack" is a 2006 CH Rawhide 460-horsepower Mack truck carrying an Eddie Paul customised Trans Am as "Lightning". CEO Denny Slagle took part in CBS' Undercover Boss in 2011. In the 2001 movie Vanilla Sky, a green mack truck almost crashes into David Aames's mustang, stopping just in time. ^ "Mack Mission/Origin/Trademark". Mack Trucks Website. Retrieved 20 March 2012. ^ "Mack Corporate History 2000–2009". Mack Trucks Website. Retrieved 20 March 2012. ^ Barron, Richard M. (September 4, 2009). "Mack Moves South: Bulldog in Tow". Archived from the original on September 5, 2012. Retrieved 2009-09-04. ^ "Macungie Assembly Operations". Mack Trucks Website. Retrieved 20 March 2012. ^ Warth, Thomas E. (1998). Mack Trucks Photo Gallery. Iconografix. ISBN 1-882256-88-3. ^ a b Sebree, Mac; and Ward, Paul (1973). Transit's Stepchild: The Trolley Coach, pp. 156–161. Los Angeles: Interurbans. LCCN 73-84356. ^ Doyle, David (2003). Standard catalog of U.S. Military Vehicles. Kraus Publications. pp. 223–229, 245. ISBN 0-87349-508-X. ^ Calderone, John A. (1997). The History of Fire Engines. Brompton Books Corp. pp. 62, 64, 72–74. ISBN 0-7607-0101-6. ^ Calderone(1997), pages 67, 80. ^ Phippard, Martin (December 1978). "Intertruck: Canada". TRUCK. London: FF Publishing Ltd: 32. ^ "AB Volvo – press release". Cision Wire. Archived from the original on 2012-07-30. Retrieved 2006-11-15. ^ "Mack unveils natural gas-powered truck". News & Record. 2010-10-26. Archived from the original on 2012-03-08. Retrieved 2010-10-27. ^ "Cape Cod Fire Department:Mack Fire Apparatus". Retrieved 2006-10-04. ^ "Motor Trucks of America". B.F. Goodrich. 1918. p. 148. ^ Page, Victor Wilfred (1921). "Modern Truck, Design, Construction, Operation, Repair,…". Norman W. Henley Publishing. p. 54. ^ Warth (1998), pp. 24–26,28–31, 35–44, 46–48. ^ Doyle (2003), pp. 205–207, 213–215. ^ Warth (1998), pp. 151–162, 164–168, 170–185, 195, 197. ^ Warth (1998), pp. 10, 105, 176. ^ "Mack trucks powertrains". Mack Trucks. 2014. Retrieved 1 Feb 2014. ^ Kulp, Randolph L. "History of Mack Rail Motor Cars and Locomotives." 1st ed. (1959)(Lehigh Valley Chapter, National Railway Historical Society). ^ a b c On road load rating. ^ a b c d e f g Crismon, Fred W (2001). US Military Wheeled Vehicles (3 ed.). Victory WWII Pub. ISBN 0-970056-71-0. ^ "TM-9-2800-1947 Military Vehicles". US Dept. of the Army. 27 Oct 1947. Retrieved 18 Dec 2014. ^ "TM-10-1546 Parts list Mack US Gov't vehicles 5 ton 4x2". US War Dept. Aug 1942. Retrieved 1 Dec 2014. ^ a b c d Doyle, David (2003). Standard catalog of U.S. Military Vehicles. Krause Publications. ISBN 0-87349-508-X. ^ "TM-10-1679 Maint. manual for Mack NO". US War Dept. Apr 1944. Retrieved 18 Dec 2014. ^ "TM-9-2800 1943 Standard Military Motor Vehicles". US War Dept. 1 Sep 1943. Retrieved 18 Dec 2014. ^ "Operators Manual for Truck 5 ton, 6X6, M39 series". US Dept. of the Army. Nov 1977. Archived from the original on 2014-12-06. Retrieved 23 May 2014. ^ a b "Characteristic sheet". Ordnance Tank Automotive Cmd. Retrieved 18 Dec 2014. ^ "TM-9-2320-206-10 Operator's manual for Truck tractor 10 ton, 6X6, M123, Cargo M125". US Dept. Of the Army. Apr 1977. Retrieved 18 Dec 2014. ^ Joanna Poncavage (April 22, 2006). "Mack among the stars". Morning Call. Retrieved 2012-08-06. ^ "Mack Trucks' CEO Denny Slagle Featured On CBS' Undercover Boss". Digitriad. Archived from the original on 2013-02-15. Wikimedia Commons has media related to Mack trucks.